Hi friends! Sorry I skipped yesterday. I actually had a very early appointment with a specialist about my sciatica- and then spent the rest of the day in bed resting. ARGH! Anyhoo… it’s Thursday, so time for another edition of Three for Thursday. For you new readers, this is where I show 1 item worn 3 ways. Pretty simple stuff! As usual, my lighting in my bathroom is terrible, so you can’t really tell- but these are my purple skinny jeans. They look black in the pictures- but they are actually purple- I swear! To give you a true idea of what color they are, I included the picture (above right) from Pinterest. 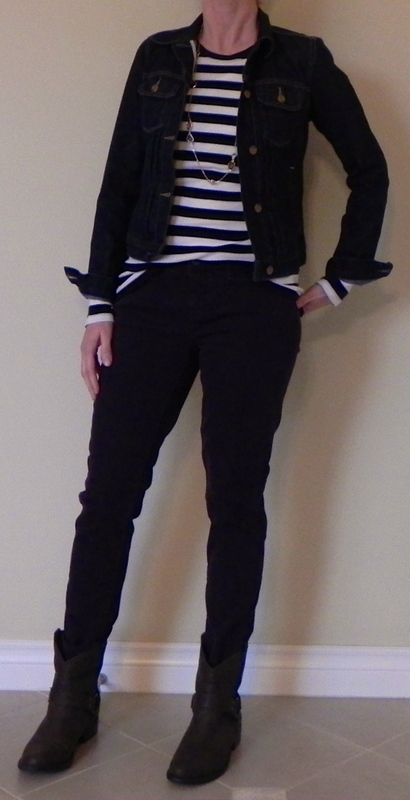 In my first outfit I chose to keep it very casual and just added my blue and white striped shirt and my denim jacket. For shoes I chose my short boots. For the next outfit, I also kept it really casual. This is a great weekend outfit- very simple, yet stylish. I chose my denim shirt and then added this cool infinity scarf and some fun bracelets. For shoes I chose my brown boots. My third look is more for a casual work outfit. Here I chose to wear a sweater (notice the cute ruffle detail around the neckline), and then I added a necklace and a stack of bracelets. For fun, I rolled the hems of the jeans and chose my leopard ballet flats. Because I was inspired- I decided to try 2 more looks with these purple jeans. The first is a bit strange- and I’m not sure if I like it or not. Here, I chose a blush colored silky blouse and then added a cable knit dark grey cardigan. I like the contrast of the feminine blouse and the chunky sweater. It’s the shoes I’m not sure about. I love these slip on loafers- but the bare ankles paired with a big cardigan may be too much of a contrast. For the last look I chose to show a date night look. Rather than just wear regular denim or black jeans, I decided to try a cute going out top with these purple jeans and added strappy black heels. Since the neckline of this top is so decorative, I skipped a necklace. Instead I added a fun chunky silver bracelet. Which outfit would you wear? Any of them? Please comment, I love hearing from you!! Love’n outfit number 3…the leopard flats give it that un-expected wow factor. Have you tried taking pics outside? That might help with the lighting, and getting true colors to show properly. I have not yet ventured into the world of colored denim. I need to step out of my comfort zone!!! Yes, taking the pictures outside is a great suggestion- the only problem is that I usually do my pictures VERY early in the morning- and it is still dark outside (or raining!). Thanks for commenting!! the first two are my favorites! Going to put on my only pair of ‘color’ jeans…my denim shirt and a scarf! I have such a hard time with what to wear with my maroon colored jeans. thanks for the inspiration! Love that last look. Those shoes are fab. Love the purple jeans! I would wear outfits 2, 4, and 5, though I think you’re right–the loafers don’t quite seem to go with this particular outfit. I would love to see what outfits you pair the loafers with in the spring, since I have a pair that I don’t quite know what to do with. I would wear the 1st and 2nd outfit for sure! Totally my mom style. I agree with you about the 4th outfit. Hmmmm, how about your fun tori burch two toned shoes instead? I like the 2nd and 3rd outfits the best. I love outfits with boots. Hope your sciatica gets better, I’ve recently been dealing with that myself. Thanks! What made you finally feel better? 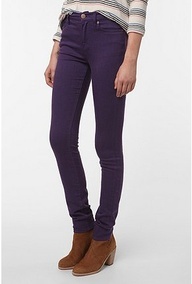 I love your purple pants and it’s because of you that I am on the hunt for a pair myself! I love all the looks but my favourite would be the one with leopard flats. I think the blush sheer/cardi looks fine without socks but I hear ya. Living in cold Canada, no socks is not an option and that changes the look of any outift that doesn’t involve boots. Thus I have had to embrace patterned socks as part of my outfits. Either that or black socks that pretend they aren’t there!